Some hybrid tetrapeptides consisting of (1R,2S)-2-aminocyclobutane-1-carboxylic acid and glycine, β-alanine, or γ-aminobutyric acid (GABA) joined in alternation, compounds 1–3, respectively, have been investigated to gain information on the non-covalent interactions responsible for their self-assembly to form ordered aggregates, as well as on parameters such as their morphology and size. All three peptides formed nice gels in many organic solvents and significant difference in their behaviour was not observed. Scanning electron microscopy (SEM) and circular dichroism (CD) pointed out that peptide 1, which contains the shortest C2 linear residue, presented the most defined fibril network and afforded nanoscale helical aggregates. 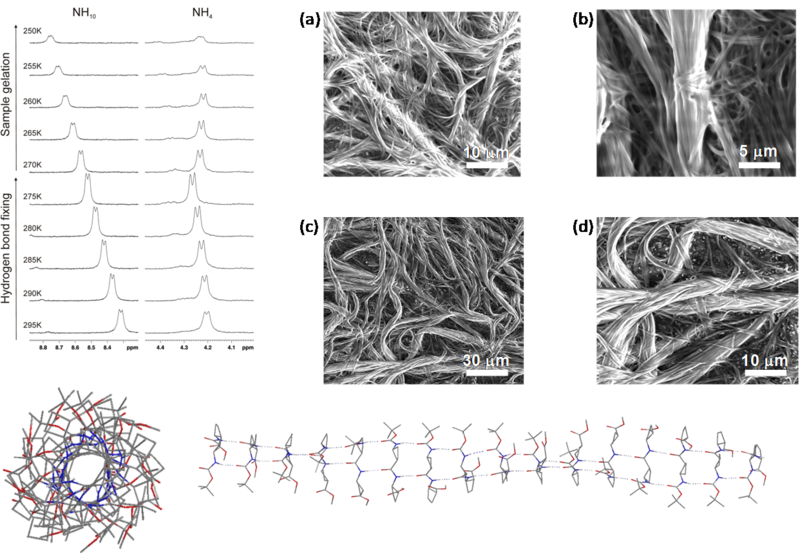 Tetrapeptide 3, with C4 linear residues in its structure, also showed bundles of fibres whereas a homogeneous spherulitic network was observed for tetrapeptide 2, with a C3 spacer between cyclobutane residues. Computational calculations for 1 allowed us to model the self-assembly of the molecules and suggested a head-to-head arrangement to give helical structures corresponding to hydrogen-bonded single chains. These features were corroborated by a high-resolution NMR spectroscopy study of the dynamics of the gelation process in toluene-d8 which evidenced that molecules self-assemble to afford ordered aggregates with a supramolecular chirality. 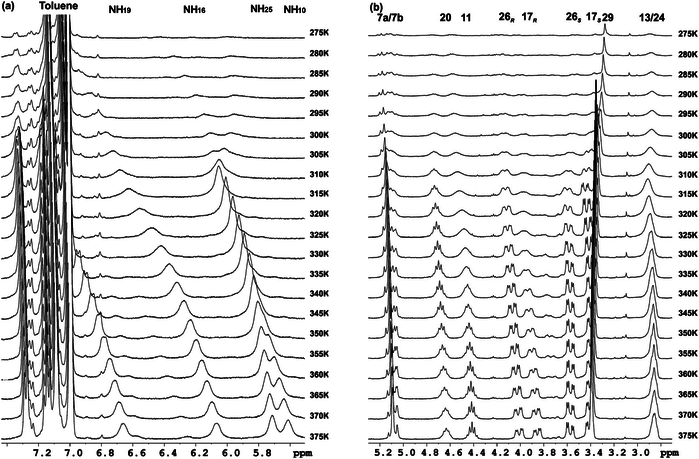 Gelation process monitored by variable-temperature 1H NMR spectroscopy experiments in 30 mM solutions of 1 in toluene-d8. A 400 MHz Bruker Avance III spectrometer equipped with a cooling unit BCU-Xtreme was used. (a) NH region from 5.6 ppm to 7.3 ppm. 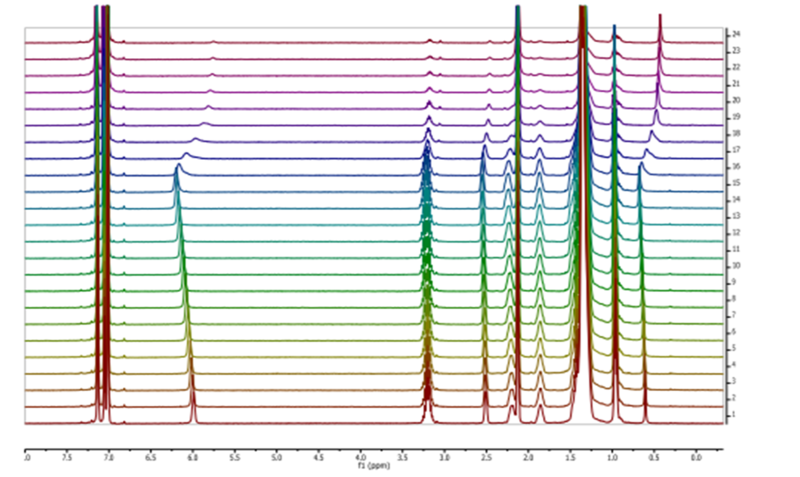 (b) Aliphatic region from 2.8 ppm to 5.2 ppm.